I am always searching for that perfect ham recipe that will make my Easter dinner special. Or Christmas. Or Thanksgiving. We love ham! I want it to be sweet, flavorful and not too dry, but I do not want to resort to using Dr. Pepper or Ginger Ale, lets keep the ingredients REAL here friends. After scouring the internet for the perfect recipe once again this year I’ve decided to take the best of several recipes and combine them into my own creation! We have beautiful boneless smoked and cured Hams in perfectly sized 2-3 lb packages. You could combine a couple if you are feeding a bigger crowd. These hams are from our very own pigs raised in our oak forest and finished on acorns. So come by our farm store this week or catch us at the Corvallis Farmers Market on Saturday and pickup what you need for your Easter Feast! Fully thaw your ham and allow it to come to room temperature for 30 minutes. With a sharp knife score a diamond pattern 1/8” deep all over the surface. First slice lines one direction then the opposite. Stick your whole cloves into the center of each diamond. Cover with aluminum foil and place in the oven to bake for 1 1/2 hours. Meanwhile combine the honey, maple syrup, orange juice, mustard, apple cider vinegar, salt and pepper in a saucepan over med-low heat stirring constantly until all the ingredients have combined and are warmed. 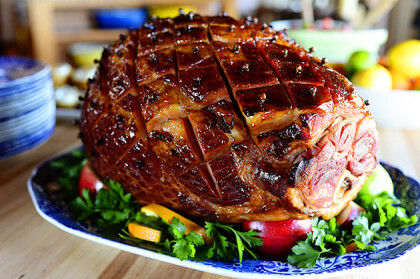 Remove the ham from the oven, and brush 1/4 of the glaze over the surface. Return to the oven uncovered and bake for 15 minutes, repeat 3 more times every 15 minutes until you have used all the glaze and your ham has a nice crusty caramelized glossy finish to it. Remove from the oven and allow to rest 15 minutes before carving.